W!ld Rice is well-known for adopting the pantomime, and infusing it with local references and jokes. With Monkey Goes West, the company pushes the envelope by adapting a Chinese legend into a British theatrical convention, while bringing in Asian practices such as martial arts, Chinese opera, and shadow puppetry as narrative devices. The plot revolves around Ah Tang (Joshua Lim), a teenager who has lost his mother and has to live with Uncle Moo (Darius Tan), Auntie Fanny (Chua En Lai), and their spoilt child, Xiao Hong (Kimberly Chan). Feeling unloved and missing his mother on her death anniversary, he runs away from home and goes to Haw Par Villa. Falling asleep, he falls into a dream state and he finds himself assuming the role of the monk in Journey to the West as he supposedly attempts to travel from Haw Par Villa to Jurong West with the help of his disciples: Wu Kong (Sugie Phua), Pigsy (Frances Lee), and Sandy (Siti Khalijah Zainal). Knowing that any journey made within Singapore’s borders is physically unimpressive, playwright Alfian Sa’at cleverly turns it into one of self-transformation. First staged in 2014, this ambitious show could have gone the way of most fusion cuisines; a hodge-podge of ingredients that form a veneer of the exotic, but they do not go together and one is left with an odd aftertaste. What keeps this production together is director Sebastian Tan’s methodical conceptualisation of where the elements should go. Alfian manages to serve up a delicious fare of innuendos, satire, and jokes which send the audience rollicking in their seats, while offering an important lesson of self-control to the children. Having entertained the audience and building up their expectations for most of the show, he falters toward the end with a slightly trite resolution in order for the moral of the story to be delivered. Additionally, the headstrong nature of Sandy which is in the original tale and key to the moral of the story is not apparent. With the script being resolutely steeped in the pantomime tradition, Elaine Chan’s music enhances that with its offering of cabaret-style tunes with the occasional Chinese motif. The songs were well thought out and it gives space for every cast member to display their vocal chops. The Chinese opera sequences and shadow puppetry figure in the fight scenes as the disciples, mainly Wu Kong, have to battle various monsters and demons (Darius Tan, Chua Enlai, and Kimberly Chan double up as King Bull, Princess Iron Fan, and Red Boy respectively) along their journey. There, these practices are left as is with traditional Chinese percussion playing in the background. As it impossible for the actors to ramp up the intensity of the Chinese opera sequences without years of training, movement coach and fight choreographer Gordon Choy circumvents this limitation by introducing farcical sequences that play to the actors’ strong sense of comic timing. Top it off with Wong Chee Wai’s lavish sets, sleek transitions, dazzling stage effects, and some of the most versatile actors in the industry, Monkey Goes West is a sheer treat for the senses. 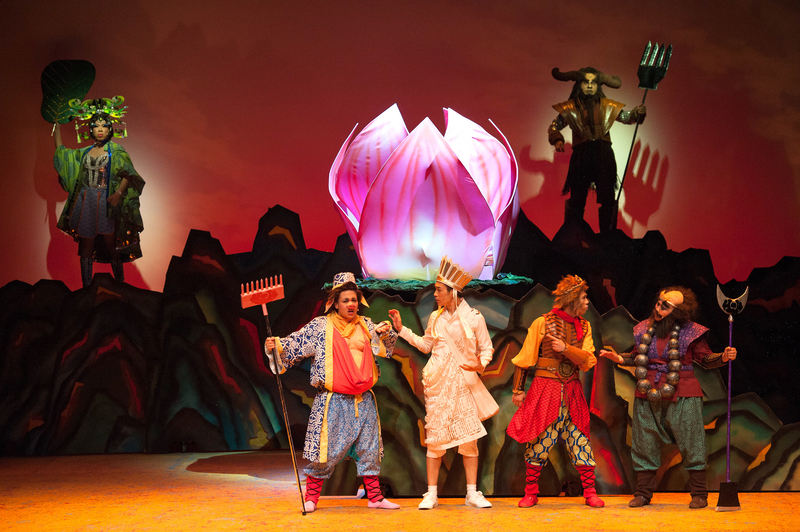 With this show being a milestone for W!ld Rice’s pantomime tradition, one wonders if it is possible for the elements from different cultures to be more intertwined without it being an incomprehensible pastiche. All the more reason to look forward to Mama White Snake, W!ld Rice’s next pantomime which draws from another Chinese tale, Madam White Snake.